Hello there. It’s been a little while since I’ve talked with you, but part of that is because of the news I’d like to share today. Some of you may remember that last year I started a Kickstarter project to help me publish a little book about my time as a volunteer in Sweden at Lake Ånnsjön Bird Observatory. That book is finally finished. It ended up being called Mountainfit, and it bears an unbelievably lovely Diana Sudyka-designed cover. I created a very limited print run for Kickstarter backers and the observatory; otherwise the book only exists in digital form. I’ve made the ebook available for purchase directly through this website. $5 will let you download a copy in three formats: ePUB, MOBI, and PDF. And it will present you with a collection of short essays—some as brief as a page and some as long as sixteen—about birds, science, myth, and the mountains of Sweden. 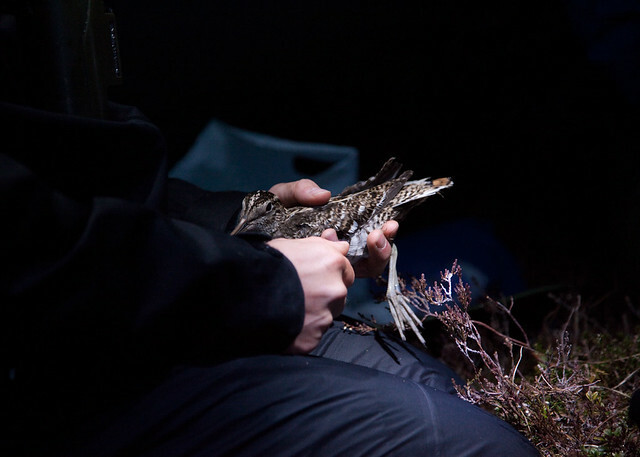 This is Raymond Klaassen with a Great Snipe, a bird about which I say quite a lot in the book. I am a poor saleswoman, but if you’re a Science Essayist reader or you follow my Tumblr project 366 Days of Words in Science,* you probably already have a pretty good sense of whether you’ll like this book or not. I did decide that while I was telling you about it here, I’d also include the table of contents from Mountainfit, because I know that when I pick up a strange book in the library or a bookstore, chapter titles are often a good way of getting a little peek into its style and content. I think that’s it! You can buy a copy of Mountainfit here. And as is always, always true, I thank you so much for reading. *Since January 1, 2012, I’ve been keeping a daily word-diary at 366 Days of Words in Science. Each post contains the definition of a scientific word, a photograph I took that day, and a tiny piece of something else: something personal, usually. So far it’s been incredibly fun for me to work on, although it’s true that every night after dinner I groan theatrically and say to Ross, “AGH, I haven’t found a word yet.” So far, there are 99 words in the series. I’ll stop when I get to 366—which will probably be in the middle of March, 2013, because I’m taking a break from electricity this summer to volunteer with the Fish and Wildlife Service in western Alaska. In the fall of 1889, just past the height of bug-season in his home state, Henry C. M’Cook—then-Vice-President of the Academy of Natural Sciences of Philadelphia and Vice-Director of the American Entomological Society—wrote a lively article for the North American Review in which he outlined ways of mitigating the reign of the pestilential mosquito. Four pages into his arguments, he found himself distracted (as we all are, from time to time) by a dragonfly. I have read of a school—if memory serves me truly, it was situate in that highly-developed center of American civilization, New York City—whose session was broken up by the advent of an innocent dragon-fly through an open window. An alarm raised by one scholar passed through the entire room: “A devil’s darning needle! A devil’s darning needle!” The ominous phrase, piped in the shrill quaver of terrified childhood, alarmed the teacher, and the agitation became so general that the school had to be dismissed as an act of humanity. I love the gentle sarcasm in that. “Act of humanity.” Dr. M’Cook, you were one sly scientist. Dragonflies, of course, do no such thing. In fact, creatures belonging to the order Odonata—Latin for “toothed,” a reference to the chewing mandibles dragonflies share with most other insects—and the infraorder Anisoptera—Latin for “unequal wings,” because dragonflies have broader hindwings than forewings—have no sting, let alone needlepoint. They are perfectly harmless to humans, if not to their prey: smaller insects, including ants, bees, and the mosquitoes that so irritated M’Cook. I tell you these things today because I spent the morning at Promontory Point, winding my way along the rocky strand where Lake Michigan hits Hyde Park—and, by the by, watching a levitation of dragonflies dart back and forth across the path and wheel between tall grasses. (I could find no consensus on the proper collective noun for dragonflies, if any exists. Mitchell and Lasswell offer dazzle; I went my own way.) Whatever you call them, they were magnificent: swift and glittering and alarmingly unpredictable—I had to duck, once, to get out of the way. So erratic were their flight paths that they seemed almost invulnerable to the greedy swoops of the ring-billed gulls that flew overhead. I’m not sure which of the hundred or so species of dragonfly known to be seen in Illinois I was looking at. But there must have been at least two distinct kinds dancing in between each others’ wings, because all were fully grown, but some were large and some were small. Dragonflies, like almost all other winged insects, have already gone through their final molt by the time they are able to fly, and so every dragon in the air is an adult. The other reason I tell you these things today is that the last time I got as close to an Anisopteran as I did this morning, I was in the New Orleans bayou, a year after Katrina. I remember being surprised then by their calm fearlessness: the way they would land on the edges of leaves right there under my nose, and turn their heads, set with eyes as heavy and faceted as precious stones. They let me come close enough to feel the air brush away from their wings as they took off again, and maybe their tranquility came from the sure and certain knowledge that they far outnumbered our curious band of swamp explorers. The coastal plains of Louisiana are dragonfly country. The air there is thick with the sound of their flight. Which is why it is so hard to think of the way that country has changed over the past six weeks. 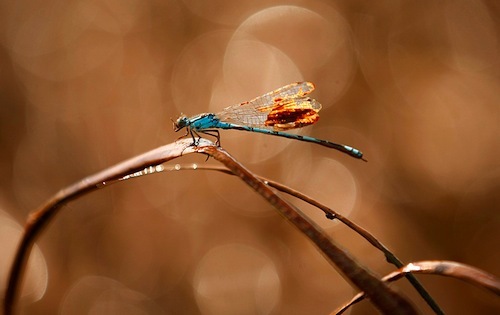 By the time we see a dragonfly, it has reached the end of its multifarious life cycle. Female dragonflies lay their eggs in or near water, and the nymph and larval stages both exist aquatically. The larvae of some species may spend a few months or as long as several years underwater before crawling above the surface to metamorphose into their final, satin-winged forms. But on the Gulf Coast, oil has flowed into the salt marshes where dragonflies lay their eggs—spread itself like a blanket over their underwater atmosphere. As long as its black covering remains, dragonfly larvae from eggs laid weeks or months or years ago will be unable to split the water’s surface without at once covering themselves in pitch. Like many other insects, fish, and mammals (though not humans), dragonflies are sensitive to the presence of polarized light. The light receptor cells in their retinas are full of the photoreceptive protein called rhodopsin. So are ours. But in the human eye, rhodopsin molecules within each cell are arranged haphazardly, with their axes running at random angles. As a result, our eyes collect light indiscriminately. We have no way of differentiating scattered light, whose waves vibrate in all directions, from polarized light—in which vibrations have been restricted to a single plane. In dragonfly eyes, rhodopsin molecules within each light receptor cell are aligned in parallel. That means the molecules preferentially absorb beams of light whose waves are vibrating in the same direction and enter the eye in the same orientation: thus hitting all those neatly arranged rhodopsin molecules at just the angle towards which they collectively lean. In other words, dragonfly eyes are especially greedy for polarized light. And since large, flat bodies of water like ponds, lakes, and oceans polarize light as they reflect it, that’s a pretty helpful attribute for an insect that hunts, mates, and lay its eggs over water. Except water isn’t the only thing that reflects polarized light. Not by a long shot. Dark-colored cars do it. Glossy black tombstones do it. Both have been shown to confuse insects like dragonflies, which often choose to mate above such objects instead of above water, and even attempt to lay their eggs on these strange, inhospitable surfaces. And then there is crude oil. Thick, black, shiny crude oil, the kind covering vast swathes of the Gulf of Mexico at the moment. 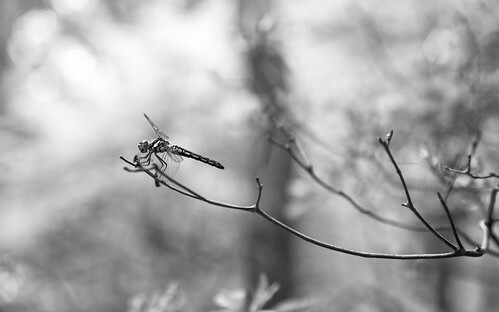 In the late 1990s, a group of Hungarian scientists found themselves intrigued by the odd behavior of dragonflies that hovered and mated around the shiny black surface of the open-air waste oil reservoir in Budapest. By comparing the number of dragonflies that were caught in traps containing plain water, salad oil, and crude oil, the researchers convincingly demonstrated that the glittering creatures “can be deceived by and attracted to crude and waste oil.” In fact, their results suggested dragonflies actually prefer crude oil to water, probably because oil more strongly polarizes light. On the Gulf Coast, then, it seems more than likely that as we speak, dragonflies are taking oil for water. We are oiling the devil’s darning needle—just when it would, perhaps, do very well to sew together our fingers and toes. I realize how determinedly morbid this is going to sound after telling you not three weeks ago that I am obsessed with death, but at 7 o’clock this morning I got down on my hands and knees in the bathroom to pull the stiffened body of a dead cat out from underneath my claw foot tub, and at 5 o’clock this evening those same two hands of mine drew the cranium and jaw bones of a raccoon, tenderly packed in bubble wrap and Styrofoam, from the recesses of a box that arrived in the mail. But hey, sometimes that’s just the way your day turns out. The expired cat was not, I hasten to add, my cat; if it had been I would be in no state to write these words. As it was I slept poorly last night, knowing the poor thing was just on the other side of the bedroom wall and likely close to death. My dreams were full of it. In life, the cat was a small, black, medium-haired beastie, with egg-yolk yellow eyes and a burbling purr (cats purr when stressed or traumatized, not just when content). In death, those eyes, I noticed, were open: their pupils—like those of human corpses—fixed and slightly dilated. When in its prime it was undoubtedly a pretty little thing. Ross and I picked up the cat yesterday evening about two blocks from our apartment. It was drenched to the bone and without visible signs of injury, but moving slowly and with an almost drunken gracelessless very uncharacteristic of a feline. We thought it might have fallen out of a window or been hit by a car, and brought it into our home with the hope that the creature would survive the night and we could take it to the nearest vet as soon as it opened today—but sadly, our best efforts were in vain. The cat had mustered what little strength it had in order to crawl underneath the tub before it died, probably because it felt a little safer in that narrow, constricted space. It was there in the morning when we went in to check on it, and if there had been any doubt about its expired status, a hand reached out to touch it made a definitive answer immediately apparent from two things: coolness and rigidity. The average core body temperature of a cat is about three degrees higher than the average core body temperature of a human, or about 102°F. If a cat has ever sat on your lap, you already know this. A living cat is a thing of reliable warmth. Mine, for instance, is a blanket that provides snug comfort in winter and transforms into a heavy irritation in summer. This cat was cool, though not cold, to the touch. In death, the systems that the body relies on to regulate its temperature start to fail.The rapid contraction and expansion of the muscles that produce a warming shiver can no longer take place; nor can the vasoconstriction (tightening of the blood vessels) that keeps heat from escaping from the skin, or the chemical reactions that can transform fat directly into heat in our cells. Cold as death, they say. I can tell you that what they say is true. If I had had the means or the inclination (macabre even for me) to take its temperature, I might have been able to determine the approximate time at which this cat crossed the border between life and death. To do this I could have used the knowledge that the average mammalian corpse cools at a rate of about 1.5°F per hour, although it would have been difficult to come to a precise estimation. Algor mortis (Latin for “the coolness of death;” and death is, I fear, a cool customer) might have been affected by the size of the cat, the amount of insulation it carried on its slight frame, the ambient temperature in my bathroom and that of the tile on which it was resting, as well as other factors. Still, a calculation could have been made. It is possible, for instance, that I could have somehow aligned the cat’s hour of death with one or another of the times in which it had wandered through my fitful sleep in the form of a dream-black-cat, healthy and mewling and full of vigor. If I were of a soul-believing bent, that might have been comforting. But even if the cat had somehow managed to retain a good deal of its body heat after its death, the rigidity of its body would have told me it was gone, and had been for some hours. Rigor mortis (Latin for “the stiffness of death;” and death is, I fear, an inflexible wretch) is a tightening of the muscles that sets in in small mammals, like cats, within a couple of hours of the end. Apparently, the use of the term stiff to refer to a corpse dates back to the very beginning of the 13th century—so clearly has the phenomenon of rigor mortis been associated with death, and for so long. What causes this stiffness is a sequence of chemical events that is, frankly, marvelous. (I think so, anyway.) Here’s how it goes. Normally, muscles contract because they’ve received a signal in the form of a nerve impulse from the brain. When that impulse reaches a muscle cell, it triggers the release of a neurotransmitter called acetylcholine. Acetylcholine plugs itself into receptors on the surface of the cell, opening channels through which sodium ions enter. The sodium, in turn, causes a flood of calcium ions to be released within the muscle cells. Finally, the calcium ions enable two kinds of muscle fibers—actin and myosin—to bind together and cause the muscle as a whole to contract. In order to release that contraction, an infusion of energy is required to push out the calcium ions and return the muscle fibers to their relaxed positions. After death, accumulated calcium ions tend to leak across the cell membrane into muscle fibers, causing a contraction that cannot be released because the cell is no longer generating energy. And so: Stiff as a board, they say. I can tell you that what they say is true. By the time we looked in on our sweet, unfortunate stray in the morning, its limbs had hardened to the point where it was difficult to draw from its hiding place. Ross had to kneel beside the tub and push gently on its back legs, while I pulled gently on the scruff of its neck, to get it out. If I had held the animal up by its torso, which I did not, its legs would not have hung loose and sweetly heavy like those of my living, breathing cat. They would have remained as they were: curled around its body like armor. I could see, as he pushed and I pulled, that Ross was a little red-eyed and sniffly to see the creature in what must have seemed, to him, a strange and unnatural state. I, on the other hand, had grieved the night before. It was much more difficult for me to witness the cat as it was before death, its hot breath coming in and going out in ragged pants and its body so lacking in strength and nimbleness, as if it had forgotten how to move its four paws. Life, as the Buddha says, is suffering. But this morning as I lifted the limbs that had once lent it the lucky poise of nine lives and felt how they had gone hard and inflexible, it was clear that the cat had ceased to be a suffering being and become, instead, a body. Its very stiffness protected me from pity, providing a hard, unassailable demarcation between life and death. For that I am rather grateful, because no matter how interested one is in death, it is no lovely thing to pick up the cadaver of something whose nose you stroked the night before. I am curious, not ghoulish. 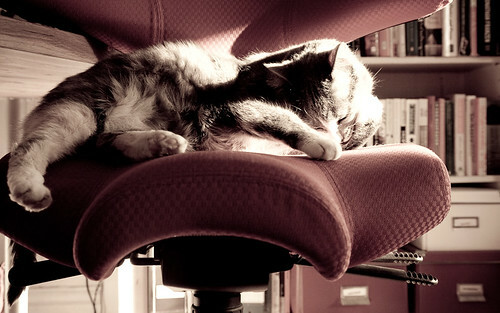 This cat’s death was both unnecessary and melancholy. 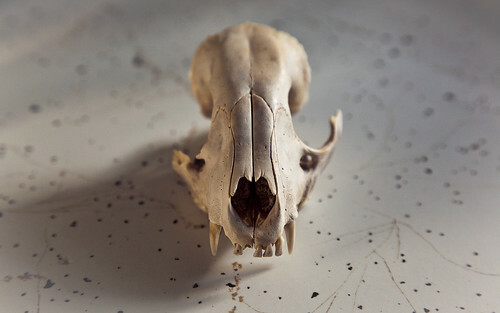 About my adoration for this raccoon skull, on the other hand, I have no excuses. A friend, knowing my predilections, offered to find it for me: and so it was found. And cleaned. And packaged. And sent. And the stiffness of its beautiful bones has a different sort of virtue.